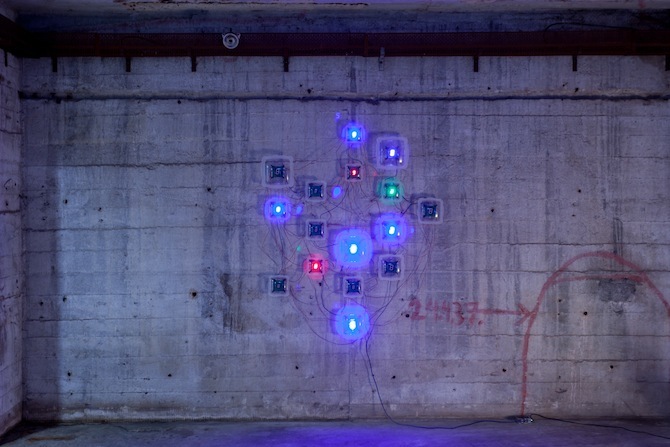 Anna-Lena: Would you say that km temporaer foregrounds positions within media art and internet-based art? Elisa: Even before km temporaer we were intensively interested in media art and internet art, examining it scientifically on textual level. This definitely influenced and inspired our exhibitions - in particular “reflecting on networks - artistic strategies using the web” which was the starting point for km temporaer. Although I wouldn’t state that we had this position in the foreground, I would rather say that we have a strong interest in the current states of production and diverse gestures of dealing with the internet, where the technological development forms an omnipresent backdrop of contemporary reality. Fayçal Baghriches contribution for the first exhibition, a documentation of a performance that was based on a few months long youtube and google research is a good example of this. Even though he’s not at all addressing the structure and features of the internet in his work and rather used its algorithm as a tool for narration in his final art work: a reenactment of the performance. Technology is interwoven with almost every present process and blends into many artistic practices and the reception art, with highly frequented blogs like contemporary art daily which offers an image based online reception of exhibitions from all over the world and thereby changes the way we “consume” art. 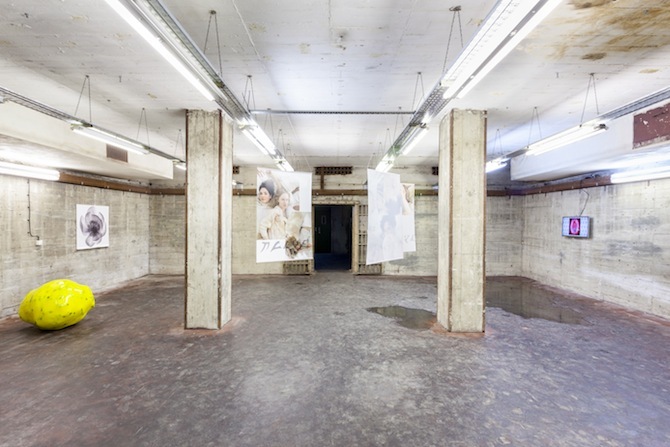 Anna-Lena: After five shows in your former rooms, you now moved to a large industrial space in Berlin-Mitte. 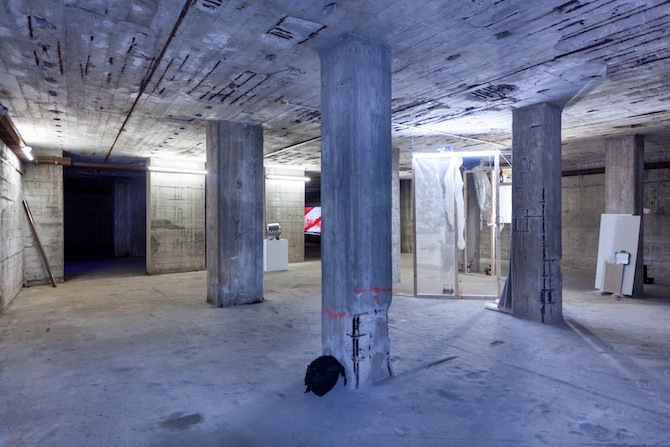 Does the rough architecture affect your curatorial strategies? Elisa: We now focus on temporary spaces for specific exhibition projects. For "surplus living" we decided right in the beginning on choosing a space that interacts with the exhibition as an independent aesthetic appearance. We didn’t want to make prominent the artificial character of the architecture and create an alleged neutral exhibition space with whitewashed walls and ceilings as used as the international standard. The old mint was the former production site for the coinage of DDR-Mark, D-Mark and Euro. 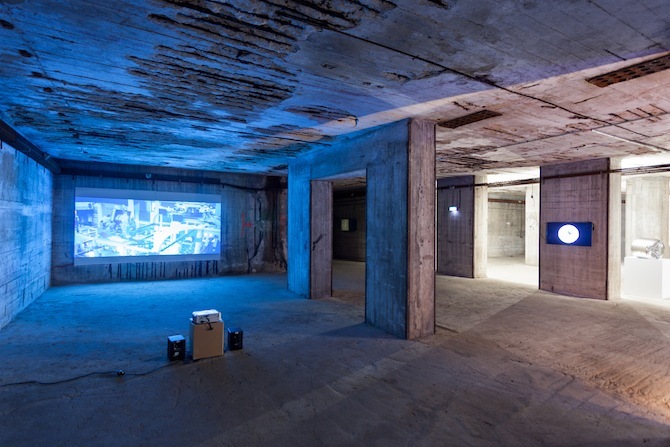 The rough bunker itself in which the exhibition took place was used as a storage location for the produced money till 2006.
of our social sphere where the virtual and real sites for production, consumption and circulation of money have become homeless spheres. Lennart: Working with such an historic and dominant architecture definitely effects the process of curating - from the way we arrange the works in the space to the actual realization of the set up. 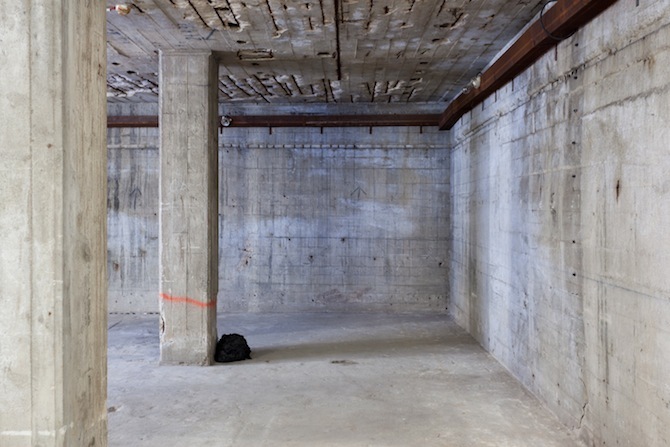 This occurs because one is constantly confronted with the question: At what point does the site itself transform into an independent art work and is no longer only the basis for the presentation of artistic works? 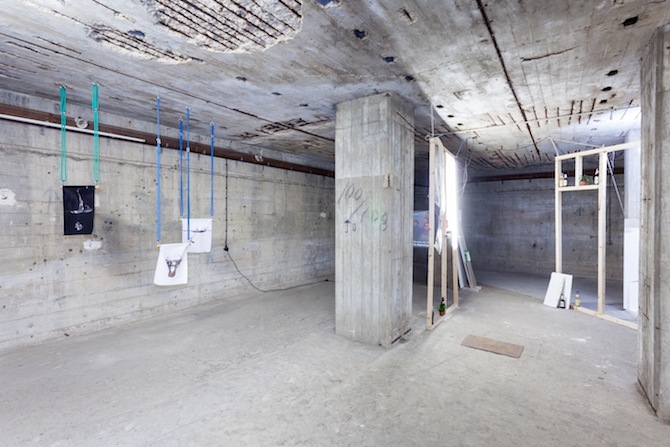 The fact that different exhibition premises are always subject to various conditions was recognizable during the whole process of organising and curating: a lot of ideas and plans had to be adopted to the specific characteristics of the bunker in the old mint. 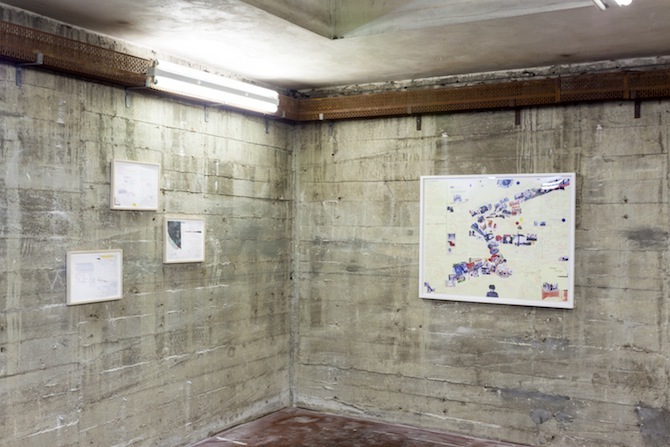 Anna-Lena: "Surplus living", the last group show you curated together with Harry Burke as km temporaer, discusses ontological debates of human capital within the economy and the arts, based on Karl Marx´ theory of 'surplus value'. Was there a specific reason for this concept? Elisa: Marx assumed that the surplus value is part of a commodity that is produced through labour and for that a worker isn’t paid. He considers labour as the site for the accumulation of capital and instrumentalizing profit. Nowadays we live in an incessant stream of permanent immaterial working, consuming and functioning, where there is no separation anymore between labour that is subordinated to the capital and other aspects of everyday life that have been incorporated in capital and serve as a source for a surplus value. Labour power has obviously transformed into life force while the vitality of the individual has become the economic resource.This is an ongoing movement in society and issue of high relevance that we felt should be addressed in a large-scale exhibition. In regard to Marx who insisted that only the workers can be seen as producers and creators as they are the only ones creating value, the question arises what is this shift’s impact on art today? And what form of commodity does it follow? Anna-Lena: There has been and there will probably always be a critical relationship between capitalism and the arts. 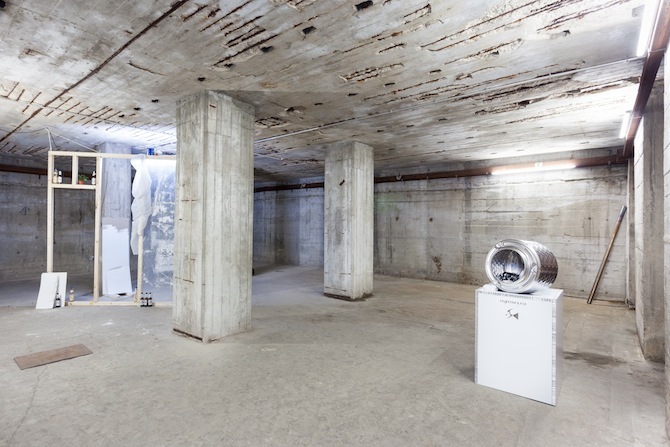 Which impulses came from the artists who participated in "surplus living"? statements and represent the mapping of multiple experiences of resistance to the dominant structures of power and capital. Lennart: In contrast, some of the artists express a new form of subversiveness and a converted understanding of criticism particularly characterising the young 80s and 90s generation. There’s a growing interest in investigating on the material basis of our contemporary world. 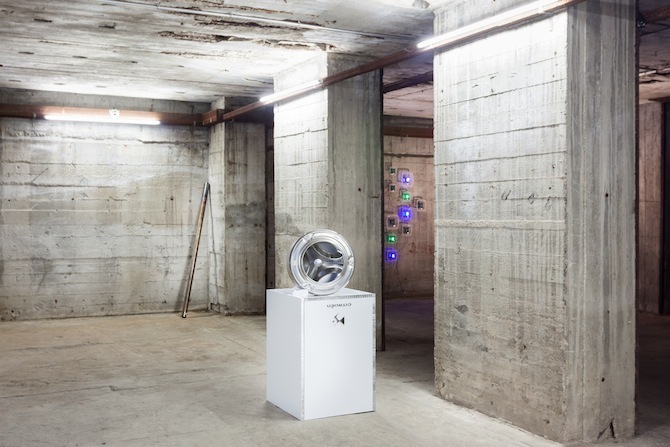 The artists abandon the idea of a critical artwork dedicated to explicit sociopolitical issues in favor of an object oriented discursively that can be partly connected to new philosophical concepts that strive for a non-anthropological view. Also political views such as “The manifest for an accelerated politics” by Williams and Srnicek, which calls for the political-left to have faith in the future and pursues the vision of appropriating the systems of capitalism and to destroy capitalism with its own means. Besides getting a lot of attention and an inflationary use of the term “acceleration” often one still has the feeling that it´s still a relatively vague connection. Nevertheless one might see quite similar thoughts and concepts in contemporary artistic practice. Britta Thie, Annika Kuhlmann and Julia Zange presented prints in the exhibition that are the product of a photo shoot by their recently founded Model Agency “Special Service” working across editorial and commercial projects. By starting a self-organised Agency they make use of the mechanism of the advertising industry and develop a critical potential that aims at subverting hierarchical structures from the inside out. Anna-Lena: The exhibition also discusses leisure - and pleasure time as a contemporary, economic value. Where do you consider the arts to be established in this issue? Elisa: I think the arts are established in a special position as their value indicates a certain ambiguity. Besides the respective market value it includes above all the changing valuation in an increasingly globalized and culturally diverse society, which is also marked by divergent political, religious or economic role models. But art has become more and more speculative in the last decades. This sort of speculation increasingly extends on both the proper value as a commodity and intangible value which also includes the artist’s social relations and reputation. Following Diedrich Diederichsen the contemporary artist constantly controlls his/her personal aesthetic as an expression for self-realization and commercalizes it to the point of self-exploitation. This situation also describes the paradox figure of the artist who refuses value extraction in favour of an alternative self-valorisation and still is most interwoven with capitalism (as described by Benjamin Noys). The leading image of the artist is exemplary of the life and work model in our neoliberal society: in relation to their creativity, the cultural and intellectual competence, in their specific organizational form of work as well as their unconditional devotion to this profession that finally blurs with leisure. Anna-Lena: Running a non-commercial project space often confronts curators with the complicated relation of an art work being both, a commodity and a strategy. How do you approach this ambivalence? Lennart: Through the presentation form of art in non-commercial environments we consider the possibility to set up a different perspective on art irrespective of the value of an art work. Such projects cannot and don’t strive for substituting the art market, but also provide a necessary and enriching complement to the existing exhibition habit. Anna-Lena: What are the future plans for KM Temporaer? 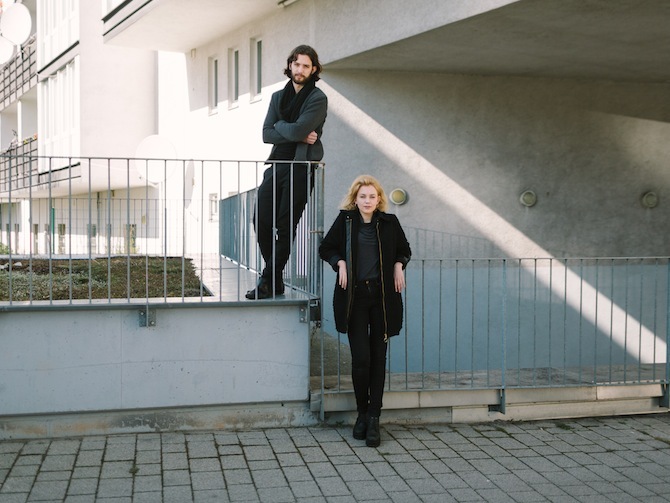 Lennart: We are currently based in New York and consider the city as an interesting challenge to operate in a totally different economic environment with other circumstances for producing and presenting art than in Berlin. It will be exciting to experience the conditions for creating and implementing non-commercial exhibitions in this city. Elisa: In the future we would like to experiment more with different specific sites for exhibition projects and investigate different formats that create a dialogue through varied forms of presentation. We are also interested in the reinvention of roles between artists, curators and researchers to explore new interdisciplinary working methods that interconnect distinct disciplines.